The upgraded Android app, which wirelessly controls Evluma LED lamps, uses a new centralized administration portal and Site license model mirroring Evluma’s Apple app. LED lighting manufacturer, Evluma, announces the release of ConnectLED v2.2 for Android, a Bluetooth Low Energy (BLE) app that enables utilities and municipalities to wirelessly control Evluma LED lighting products from the ground. ConnectLED v2.2 for Android is an upgrade to the popular v2.1. The v2.2 upgrade offers a new centralized administration portal, yet keeps the same, familiar user interface. Now offered as a Site license, a single admin may easily control an unlimited number of Basic or Enterprise-licensed users. The new version is available for download from Google Play and is compatible with any Android tablet with a 7 inch or larger screen. ConnectLED offers utilities the ability to connect/disconnect a lamp from service, set overall lamp intensity and create dimming schedules. 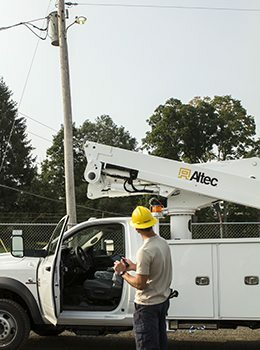 The option to control AreaMax™ and OmniMax™ LED lamps from the ground and up to 150 ft away allows utilities to avoid more costly bucket truck maintenance and service calls. The AreaMax LED luminaire for street and area lighting and the OmniMax LED retrofit for decorative streetlights carry a 10 year warranty, come with patented Photocontrol Failsafe™ and one of the most robust, integrated 20kV/10kA surge protection systems on the market. The ability to work with ConnectLED is built-in to both product lines and can be activated at any time during ownership with the acquisition of a ConnectLED Site license. In January of 2017 Evluma released ConnectLED for iOS. “Apple enterprise apps have grown in popularity with utility operations departments,” stated Cathleen Shattuck, Elvuma’s Marketing Director, “but not all utilities use Apple devices. Evluma offers ConnectLED for Windows, as well as Android.” Both the Apple iOS ConnectLED app and the new Android v2.2 app employ the same centralized administration portal and Site license model. Current owners of Android v2.1 Basic or Enterprise licenses may upgrade to a new Site license for free.